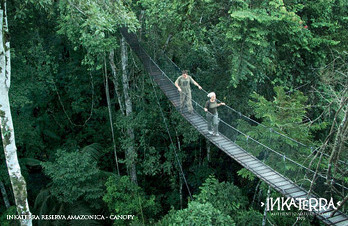 The Inkaterra Canopy Walkway is an impressive 344-metre (1,135 feet) long network of seven hanging bridges, eight treetop observation platforms and two tall towers that allows visitors to experience the Amazon rainforest from the treetops. The highest points of the circuit, the two towers, are 29 metres (nearly 100 feet) high. A tour of the circuit takes approximately one and a half hours. Suitable for children. The walkway is part of a private reserve owned by the nearby Inkaterra Reserva Amazónica lodge but anybody can visit, for an entrance fee. It is located one hour by boat from Puerto Maldonado. 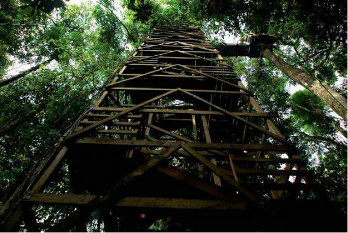 It was completed in 2004 and is considered as one of the most sophisticated and safest canopy walkways in the world, using special cables and lateral mesh on all bridges and the most resistant materials to ensure the structure withstands Amazonian conditions (its builders estimate the structure’s lifetime to be over 30 years). It also incorporates a camouflage design to blend in with the surrounding environment and was built using ecological materials and a bolt system that minimises impact on the rainforest. Proceeds from entrance fees are used to support ITA, a not-for-profit non-governmental institution that contributes to conservation and social projects in the local area. Entrance to the walkway includes a visit of the Interpretation Center where visitors can learn about the complex eco-systems in the area, the design and construction of the canopy walkway and the work of the ITA.